Viewing the bat emergence can be one of the most amazing experiences in nature. Please be "bat friendly" & enjoy watching the bats without causing harm to the bats or yourself. Please sit or stand several feet away from the bridge during the emergence to give the bats plenty of room to fly. Please do not stand under the bridge during the emergence. Bats prefer the dark, especially when first emerging from their bridge crevices. Do not use flashlights or camera flashes during the emergence. Loud voices can alter the bats’ emergence behavior. Please be considerate by keeping the noise levels down. Please supervise your children & pets while visiting the bridge. Please do not throw objects at flying or roosting bats. We share this bridge peacefully with the bats. Do not touch or pick up a grounded bat for any reason. If the bat is on the ground, it may be a young bat still learning to fly, or it may be ill. Grounded bats will bite in self-defense. The bat emergence time from the bridge is not completely predictable. The bats usually emerge after dusk each night. The emergence times vary, known only to the bats themselves. Sometimes the bats surprise viewers & emerge before sunset or well after dark. Try to arrive about 15 - 30 minutes before the official sunset time for that evening. Have a seat & enjoy the evening while waiting for the bats to emerge. On rainy or cold nights, the bats might delay their emergence & will stay home in the crevices if the temperature is below 50 degrees at sunset. The thickness of the emerging cloud of bats varies between several hundred per minute to several thousand. If the emergence is small one night, come back again & again. The highest bat population at Waugh Drive is usually in August & September. Some of the best emergences have been observed in the summer & fall months. Bat Chats� are held on the first (1st) and third (3rd) FRIDAY nights each month, year-round. To hear the �Bat Chat� about bats in general and the Waugh Bridge Bat Colony, please arrive 30 minutes before sunset and meet at the Viewing Platform, corner of Waugh Dr and Allen Parkway. Houston Area Bat Team volunteers will be available at the bridge to answer questions and assist with viewing. The Houston Area Bat Team volunteers participate from the Houston Parks & Recreation Department, Texas Parks & Wildlife Department, several Texas Master Naturalist chapters, the Houston Zoo, Buffalo Bayou Partnership, and the Bayou Preservation Association. 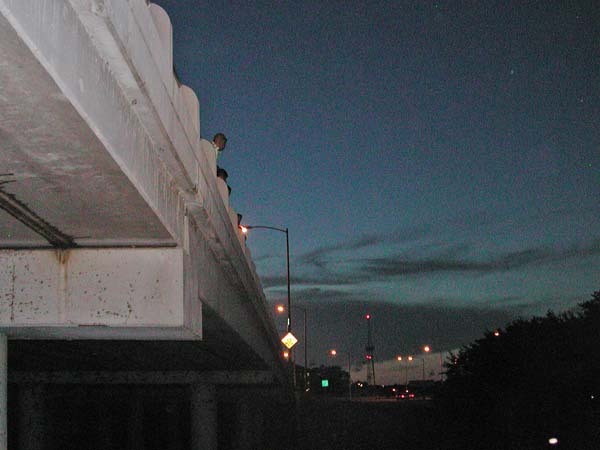 Prior to emerging from the bridge, the bats chatter social calls to each other among the crevices. Please don’t stand beneath the bridge during this time because the bats tend to void wastes in preparation for flight. Eventually the bats begin dropping from the crevices, often forming a whirling vortex beneath the bridge. Researchers believe this vortex allows the bats to gain altitude & speed. Then the bats exit the bridge on the east side, often flying along the bayou toward Downtown. Wildlife predators often lurk along the eastern banks of Buffalo Bayou, waiting for the bats to emerge each evening. Visitors have observed red-tailed hawks, cooper�s hawks, sharp-shinned hawks, and peregrine falcons swooping into the cloud of bats as they exit the bridge. Night herons often wait on the bayou banks beneath the bridge to catch bats as well. It is all part of the predator-prey cycle of life. Once the light has grown too dim for birds to see well, the birds go to roost and the bats are able to fly freely through the night, hunting for insects. May through August is �baby bat season� at the bridge. Each female Mexican free-tailed bat gives birth to one pup, usually in May or early June. The first of the little pups begin flying in early July. As the young bats take their first flights around the bridge, they�ve been described as looking like large butterflies due to their rapid wing beats. The Waugh Drive bats prefer to emerge from the eastern side of the bridge. The Waugh Bat Team volunteers recommend the following spots for optional bat viewing. 1) The Waugh Bridge Bat Colony Observation Deck, corner of Waugh Drive & Allen Parkway, directly across from the American General building. Start here to watch the bats swirling beneath the bridge prior to their emergence. 2) The gently sloping, grassy northeast bayou bank, corner of Memorial Drive & Waugh Drive in Buffalo Bayou Park. 3) The Waugh Drive Bridge sidewalk, standing against the railing on the east side of the bridge, facing the Downtown Houston skyline. Please use caution & be ever mindful of the traffic, pedestrians, and bikers utilizing the bridge as well. 4) The Gus M. Wortham Memorial Fountain along Allen Parkway, east of Waugh Drive. 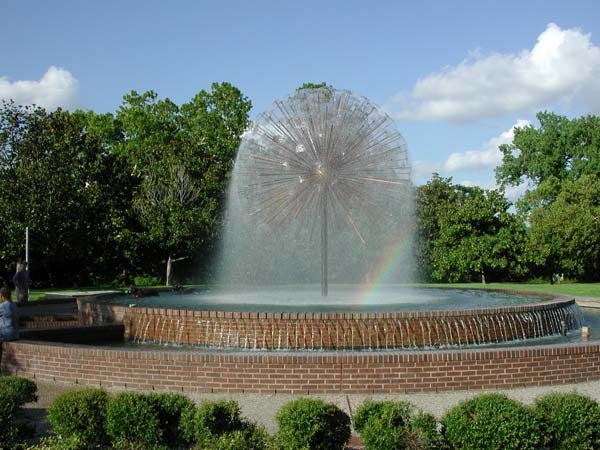 The fountain is lovingly known by Houstonians as the “Dandelion Fountain” due to its shape & design. If you stand along the sidewalk near the bayou tree line, the bats often fly directly overhead. Parking is always available at Spotts Park or designated parking areas along Allen Parkway. More than 1,100 bat species have been discovered worldwide. The United States is home to 47 bat species. Texas is home to 33 species of bats. The largest bat in Texas is the Western Mastiff bat, with a wingspan of 20.9 to 22.4 inches. The smallest Texas bat is the Western Pipistrelle, with a wingspan of 7.5 to 8.5 inches. Both of those bats reside primarily in western Texas. Greater Houston is home to 11 bat species, all insect-eaters. 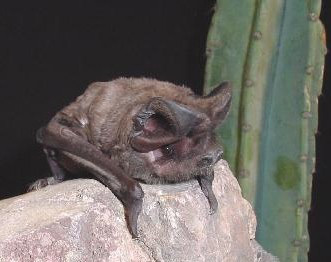 Those species are: Mexican free-tailed bat, big brown bat, evening bat, Eastern red bat, Northern yellow bat, tri-colored bat (previously known as Eastern pipistrelle), hoary bat, Seminole bat, Southeastern myotis, silver-haired bat, and Rafinesque�s big-eared bat (state threatened species). �Bats are NOT blind! They have average vision, excellent hearing, and the added ability to use echolocation like an extra sense. Bats in Houston eat insects. They find their insect prey using “echolocation,” which is the use of ultra-high frequency sounds for navigation. Bats & dolphins are mammals known to use sound to see! The bat sends out a pulse of sound from its mouth. The sound bounces off an object, such as a moth, and then echoes back to the bat’s ears. The bat continues to send out the sound pulses until it catches the insect. Bats use echolocation to catch prey in total darkness. Because they can sense objects in front of them so well, they don’t become tangled in people’s hair or land of people with specifically-colored shirts, contrary to popular myth. The Mexican free-tailed bat (Tadarida brasiliensis) is a medium sized bat with a wingspan of 11 to 13 inches. Its life span is approximately 13 years. Mexican free-tailed bats live in large caves, bridges, buildings, tunnels, and bat houses all across Texas. Baby Mexican free-tailed bats are known as “pups”. A female bat gives birth to one pup each spring & temporarily leaves it behind when she emerges to hunt. Each mother is able to find her pup among the thousands in the colony each day by remembering the approximate location where she left her pup, and by recognizing her pup’s unique voice & scent. Mexican free-tailed bats love bugs! Bats are important for pest control since they eat insects & agricultural pests. Favorites on the bat menu are moths, ants & beetles. A Mexican free-tailed bat can eat up to two-thirds of their body weight in insects. The estimated 100 million Mexican free-tailed bats living in the Texas Hill Country could eat up to 1,000 tons of insects each night. 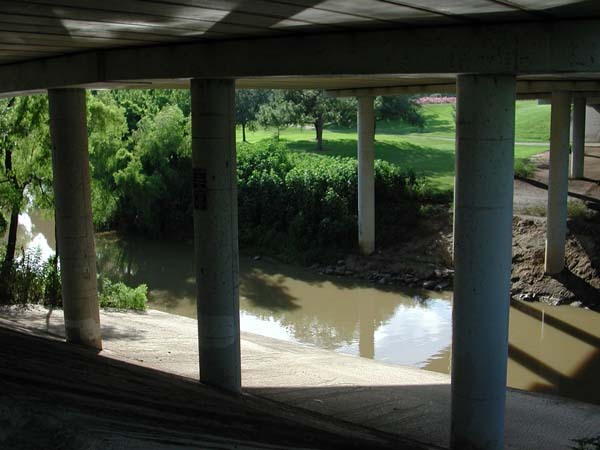 Here in Houston, the estimated 250,000 Mexican free-tailed bats at Waugh Drive bridge could consume almost 2 ½ tons of insects each night. The Mexican free-tailed bat is a gentle creature that will not harm visitors if left alone. However, visitors are warned against touching a bat as it may bite in self-defense. Bats, as with all mammals, can catch the rabies virus. Bat Conservation International research states that less than ½ of 1 percent of a bat population may contract the virus. The ill bat dies quietly, unlike myths & stories about dogs & other mammals. However, for these reasons, please do not touch a grounded bat.